You might have seen games by Adrenaline Amusements at the arcade before, through games like Fruit Ninja FX or Infinity Blade FX. 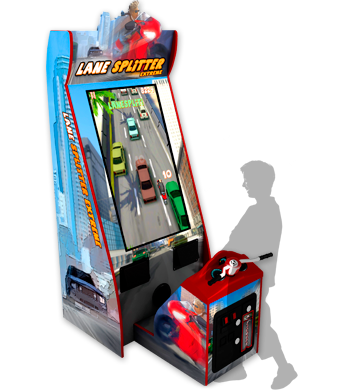 As IAAPA approaches fast, we are going to start getting some more announcements as to what will be there and for Adrenaline they have two new videmption products, housed in a new cabinet design, Black Out and Lane Splitter Extreme. 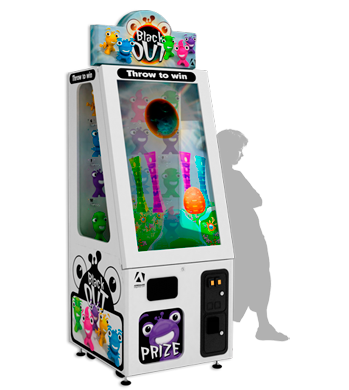 Black Out is a prize merchandiser, which we don’t cover too often here although that might change with future upgrades to the site here. The closest thing I could currently compare it to, although it is kind of a stretch given the new technology at play here is Andamiro’s Winner’s Ringer. This one really stands out over anything else on the market and to see why, you have to see this in action. It uses technology that I had seen in a brief video of from a vending machine trade show where you have a transparent LCD, i.e. a display overlay in the glass. Aside from sci-fi terms like transparent aluminum, this has to be the coolest sci-fi type tech to come along in a while. Black Out uses this but goes further with a large screen and it’s multi-touch to boot so it can be interactive instead of just a really cool passive display. Integrating this into a prize merchandiser is a brilliant move but I also imagine that it could go further, creating entertainment only video/mechanical game hybrids that would further stand out from any home gaming experience. Using this new cabinet design, Adrenaline has also decided to bring another smartphone game to the scene but with a distinctly arcade touch to it – instead of keeping the game touchscreen based, it has motorcycle handlebars. The mobile gaming craze has brought a lot of content to it but that content isn’t always the perfect fit for a touchscreen and arcades can benefit from their hardware angle in making a game more interesting or simply better by offering a control style that actually fits into what the game was implying in the first place. Anyways, the game in question is called Lane Splitter Extreme, the Extreme part being a new addition to the title. From the looks of it, it is similar to Temple Run but you ride a motorcycle instead (anyone who has played both games can correct me if I’m wrong on that). The information on this so far does not indicate if it is videmption-only or if the tickets can be switched off if the operator desires although that has been the case with Infinity Blade FX and Fruit Ninja (although I haven’t heard of anyone disabling the tickets on FN). As both games will be at IAAPA, I will get some video and hands-on time with these and more. re: Fruit Ninja w/o tickets: I was on the Disney Magic over the summer (said out of New York). Their arcade was in decent condition and had a Fruit Ninja that wasn’t dispensing tickets. Their setup is such that tickets don’t make sense (they do have some prize games, but no tickets).